In the face of a worldwide economic recovery and the fourth largest bull market in history where can all the doubt, ?anger, and hate, come from? From the Paris attacks to inciting riots at Republican presidential primary rallies, the hate runs deep. In the face of the rolling optimism in the annual 25% plus rate of gain in stocks since 2009, the media is as full of the negative story headline as it was back in 2011 when the majority predicted the next leg down of the supposed secular bear market. In the media interviews and the market analyst headlines both traders and investors read bearish to ultra-bearish content like I would vote for Mr. Trump because he may only destroy the U.S. economy, but Hillary Clinton will destroy the whole world.” Granted that both Marx Farber and Bob Prechter, have been bearish from the year dot, there are so many newcomers all trying to be the next big name in market gurus? Major headlines from one of the highly touted trade journals read More Pain Ahead! Sell These 25 Stocks NOW! How many of these type of headlines to do you see each day?? Here is one that ranks high in Google search. It’s a close friend of Donald Trump, Carl Icahn, who was picked and accepted to be treasury secretary if Trump is elected but of course he later declined. Now consider the source: Daniel Ivandjiiski, a Bulgarian-born former hedge-fund analyst who was barred from the industry for insider trading by FINRA in 2008, is the founder of the site. The number of Doom and Gloom blogs and the Crash of 2016 books has saturated the web; everywhere you look you see:? The public is walking into a trap again as they did in 2007. ?And the prophetic economist Andrew Smithers warns U.S. stocks are now about 80% overvalued. What traders and investor need to know, is that with this much warning, investors and traders should be well hedge or in cash and waiting for the another 2009 to buy.? So now you understand what drives these super bearish predictions. From Shakespeare to Quentin Tarantino playwrights have been taking advantage of human emotion to sell audiences their performances for centuries.? The list of modern-day movies is endless. From Kill Bill to Gladiator to Inglorious Basters but it’s not too late for investor and trader to remind themselves it is only a movie!? In the case of the trading markets, it is only marketing; people buy into revenge, and many feel taken advantage of back in 2007. Thinking Mans Trader could care less what Wall Street rejects are touting or how a billionaire is gaining headlines. As a professional trader and founder of an elite group of traders, we are direction neutral. We use objective tools to tell us when conditions are available for our strategies, we manage the systems and let the market takes us into the trade. You were good and lucky enough to find my group and me and here is what we want you to gain from it, and it is not a giveaway, and the prices of our services are going up. As the quantity of vendors, sky rockets the likelihood of you finding a quality service declines, its simple math. I know what you are thinking, Even a trained ape can make money in a bull market. You are right, and I sincerely hope you have done as well as my traders. But there is something you need to know. Bear market trading is my forte. Is it yours. Would you like it to be lookLook how %BB-DBR did in January? One of the benefits of working with TMT is rather than have a lone creature sitting at a desk hoping he doesn’t go down the proverbial rabbit hole, you have a team, a wolf pack, to guide you to success, regardless of the market. A wolf pack embodies a strong sense of intelligent community.? The TMT community is symbolic of many wise minds connecting to bring balance, success, and freedom to their trading. 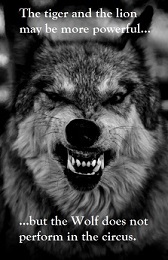 A lone wolf may not make it during rough markets. But the wolf pack of TMT provides you the knowledge and precise discernment to bring out the best in your trading. Yes. Even in a Bear market. You must act now and learn to bring out your best trading in a Bear market. No matter if you are an options trader, an index fund investor, an EFT trader, a futures trader or a private capital manager, TMT provides you with trading strategies to fit your needs and more over a constructive environment and communications. You benefit from decades of successful strategy development and trading experience; you will gain objectivity. Take your trading up a level,?Join Thinking Man’s Trader, receive the TEM weekly or available real time in the TAS plus additional services provided to keep our traders the best informed in the industry. TMT has ready to trade systems – both day trade and swing trade – available for free trials to members only. Invest $69.00 in your trading future, become a Thinking Man’s Trader today. NOTICE: TMT invests in you, provides one on one tutoring and trader to trade group support. We provide the best value in the industry. — Thinking Mans Trader does not assume the risk of its clients trading futures and offers no warranties expressed or implied. The opinions express here are my own and grounded in sources I believe to be reliable but not guaranteed. — Pricing is subject to change without notice.? My indicators and strategies can be withdrawn for private use without notice, at any time. — TMT caters to individual traders and capital managers only. –Thinking Mans Trader does not have a refund policy all sales are the finale. –Trading futures and options involve the risk of loss. Please consider carefully whether futures or options are appropriate to your financial situation. NO WARRANTY / NO REFUND. TMT MAKES NO WARRANTIES, EXPRESS OR IMPLIED, On ITS PRODUCTS AND EXPRESSLY DISCLAIMS ANY AND ALL IMPLIED WARRANTIES OF FITNESS FOR A PARTICULAR PURPOSE. IN NO EVENT SHALL CBI BE LIABLE FOR ANY DIRECT, INDIRECT, SPECIAL, OR CONSEQUENTIAL DAMAGES IN CONNECTION WITH OR ARISING OUT OF THE PERFORMANCE OR USE OF ANY ?PORTION OF ITS PRODUCTS.